2013 Road Trip Photos #19: Land of the Pilgrims’ Pride « Midlife Crisis Crossover! After spending the first half of Day Five on the Hyannis Whale Watcher Cruise, we headed back west toward our Boston hotel, but with one more stopover in mind along the way: the town of Plymouth, location of the celebrated area where those stalwart adventurers known in American textbooks as the Pilgrims settled in 1620, established a new life apart from the Church of England, and invented the Thanksgiving holiday that large American department stores have all but abolished. 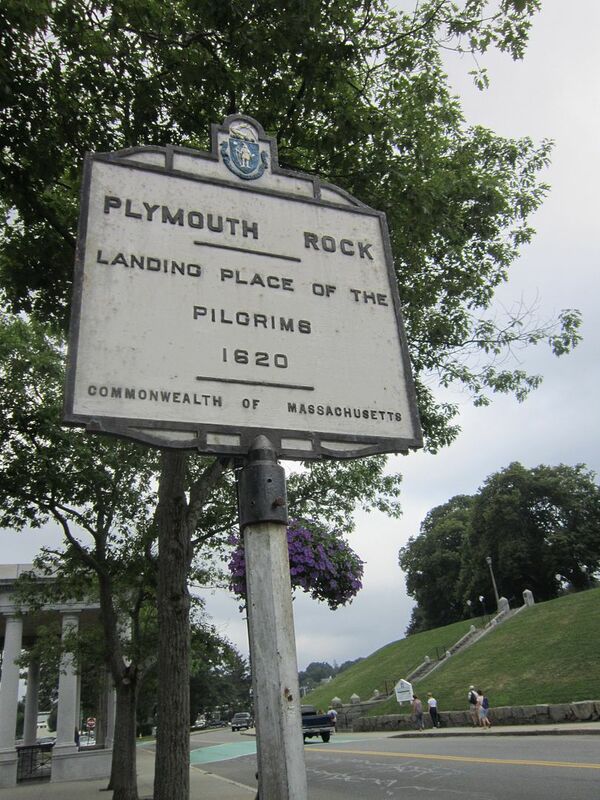 Plymouth’s star attraction is, of course, one of the most famous pebbles in America: Plymouth Rock. 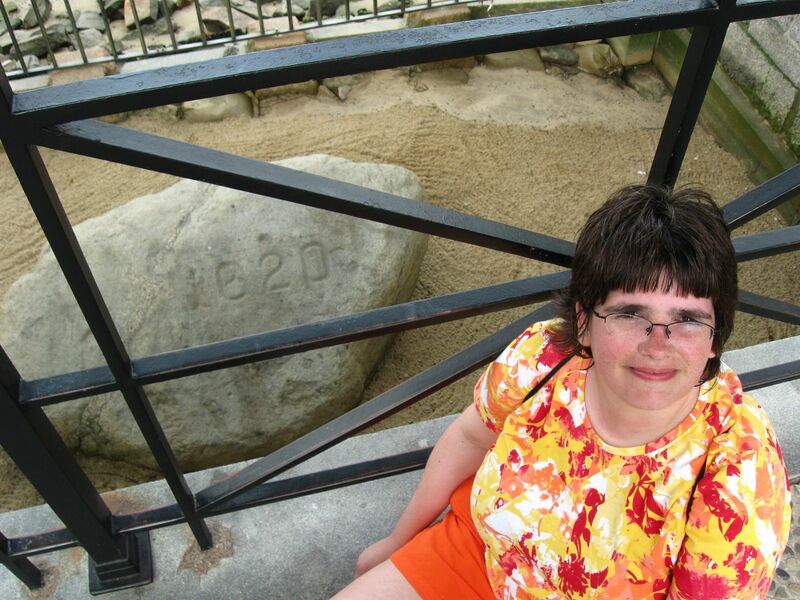 Legend and history share billing in its tale, but contemporary sources corroborated the age of the designated Rock, which dates back to at least the 1770s, if not quite to the original walking path of the Pilgrims themselves. Either way it’s certifiably centuries older than we are. 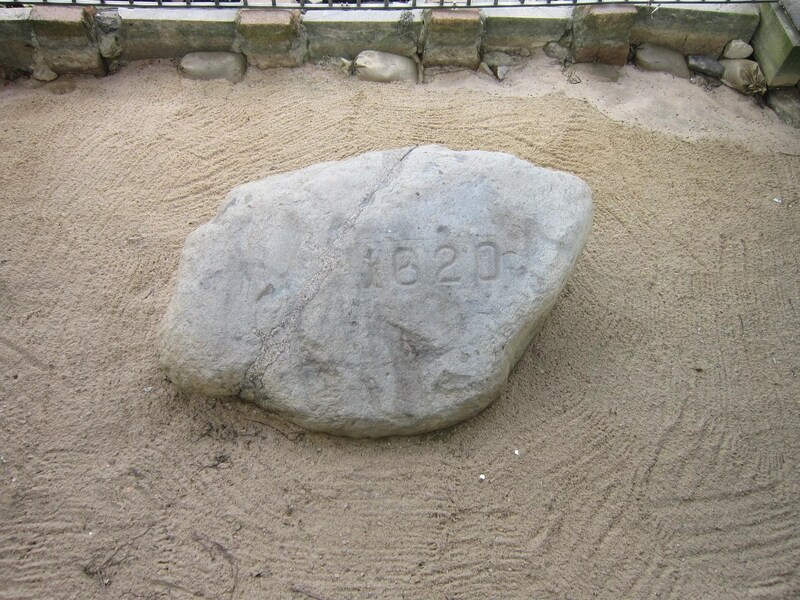 The Rock is located in Plymouth Harbor, kept down in a sandpit with rails to prevent grabby tourists from eroding it with their fingerprints or sprucing it up with graffiti. As protection against the elements, and because sandpits alone don’t exude dignity or patriotism, decades ago someone surrounded the Rock with columns and a roof, just like all the best tourist attractions. Beyond the columns: mandatory signage for historical perspective and for visitors who need that extra confirmation that they’ve come to the right place. 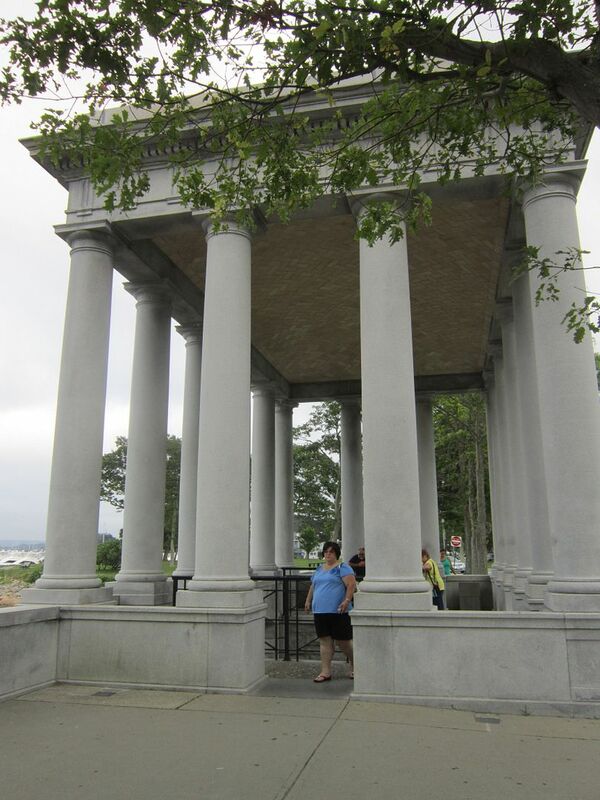 Down the street: more old things beginning with “Pilgrim” and also containing columns. 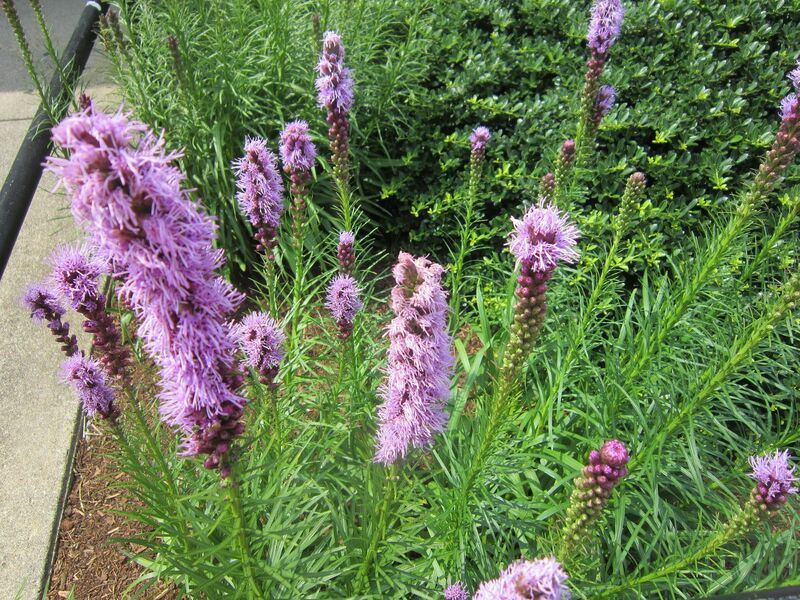 Pleasant Plymouth, prominent parking place for Pilgrims past, primly proffers pretty purple perennials. 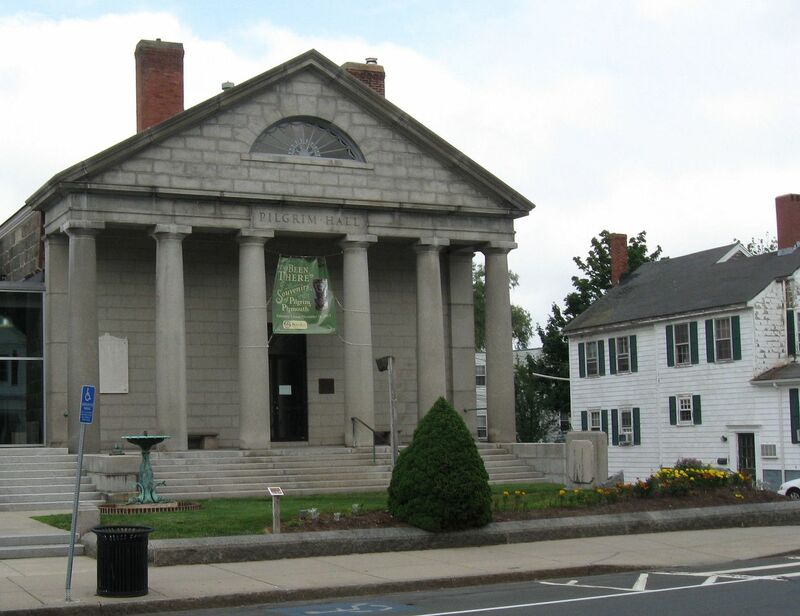 For residents and nautical-minded tourists, Plymouth is nestled against Cape Cod Bay. 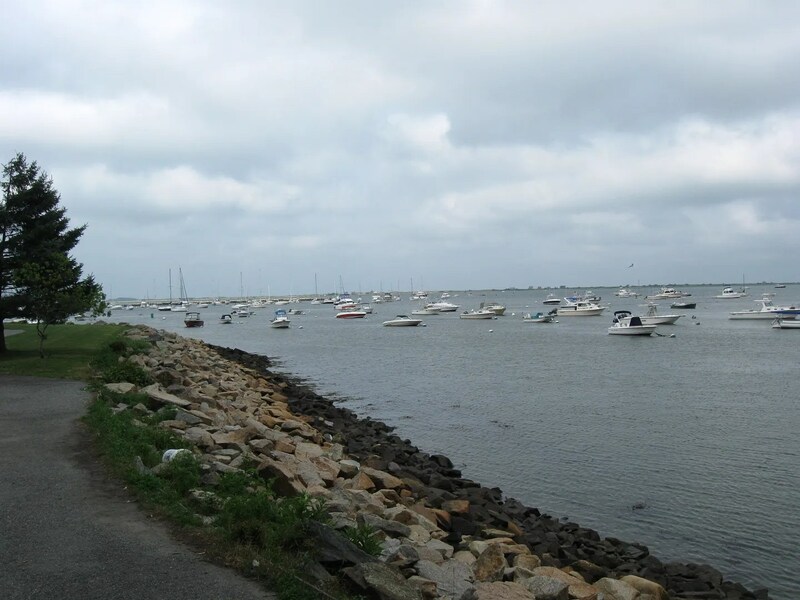 The “Harbor” in Plymouth Harbor is no slangy misnomer. 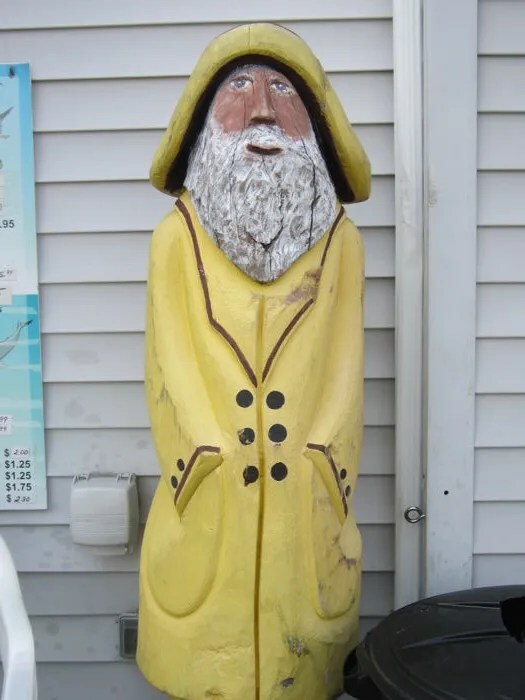 Pilgrims may once have prevailed over the land, but residents and tourists are just as likely to accentuate the seafaring aspects. Although you’d expect our centerpiece meal to be Thanksgiving in July, with roast turkey and all its institutionalized side dishes, holiday trimmings were far from our minds. By this time we’d been in Massachusetts a few days and had hardly a morsel of their renowned, easily accessible seafood. 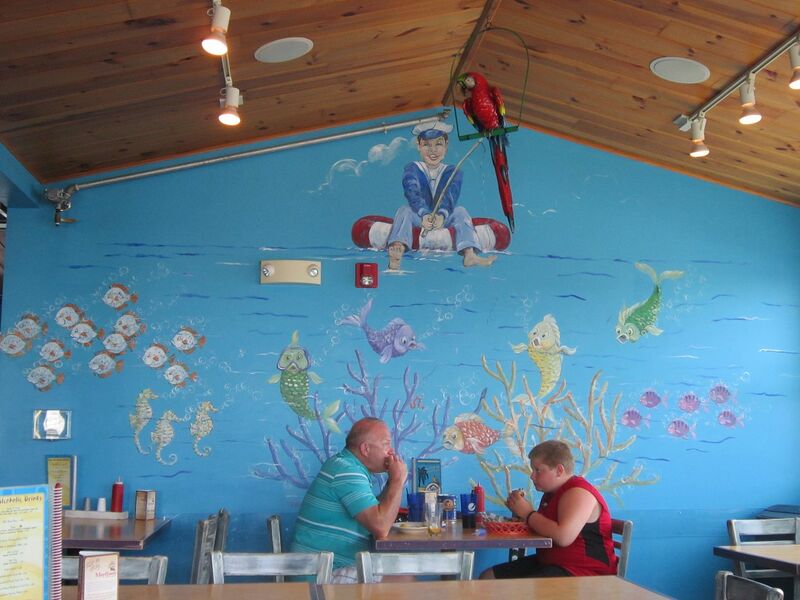 Our late lunch, then, was at a local joint called CabbyShack. If fishing poles and cartoon murals had been around in 1620, I like to think the first Thanksgiving would’ve looked a little something like this. …give or take a stuffed parrot. To be continued! And Happy Thanksgiving!